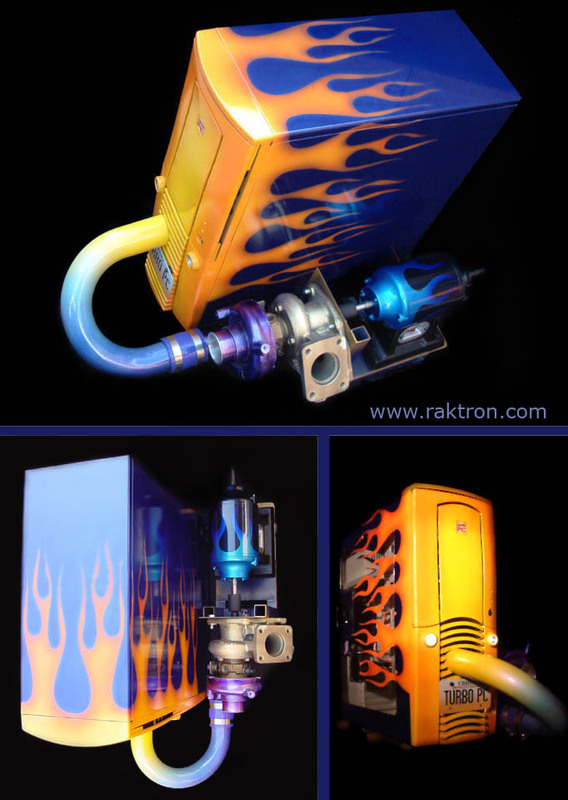 This was our first PC Case Modification, and this computer generated more attention than we ever could have imagined. Featured in two magazines and many websites (including hardocp.com), the response was overwhelming, and we'd like to say thanks to those who sent in positive comments. It made all the effort worthwhile. We thought a fast computer should have hot rod flames, working headlights, and a custom license plate. As for the cooling system, an LED case fan just wasn't going to be original enough. Instead, our case fan is a turbocharger commonly found on late 1990's Mitsubishi Eclipses and Eagle Talons. The PC industry has abused this cliche for decades to refer to performance upgrades. This is the first time it's ever been done for real. Frequently Asked Questions: I receive a lot of email with similar questions and comments. I think some people are missing the point, and are taking this modification way too seriously. The primary focus was on looks (and to make a statement about how a word unrelated to computing gets thrown around by the PC industry with no thought to what it means). It has the added bonus of being actually functional, but that is secondary to what I was trying to accomplish. Q: What's the temperature drop? A: I have no idea. It's probably nothing to write home about. Does it matter? Q: What PSI (how much pressure) does it run at? A: None. The PC case isn't sealed. The idea is to blow air through the case, not to pressurize it. If the computer's case was sealed tightly enough to where pressure could actually build up, the side door would fly off and the USB cables would pop out. Q: How fast does it spin? A: Of course. It's just not very practical, and I honestly don't plan to run the "cooling system" on a regular basis, just once in a while for a laugh. What is a turbo? It's an air compressor that pressurizes the air in the intake manifold of a combustion engine. Instead of increasing the displacement (volume) of the combustion chamber, the turbo makes more power by stuffing more air into the same space. The turbo is powered by hot exhaust from the exhaust manifold, which flows over the blades of the turbine wheel. This wheel spins the shaft which also turns the compressor wheel in the intake path. This computer case mod uses it in a different way. Cool air is forced into the front of the computer's case, helping to reduce temperatures. Cooling is essential to maximizing overclocking performance, and to increasing the lifespan of the components inside. 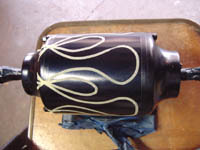 Since there is no exhaust to spin the turbine wheel in this case, an electric motor is used to drive it with a coupling shaft.